A southern breeze blew warmly as our heroes returned from Lance Rock. Having driven the mad necromancer out of the area, the heroes returned slightly changed for the better. Feeling the shame of having a foe escape from his grasp, Hoggle decided to change his name to Visk. As the party entered the inn, they happened upon a pair of humans who were discussing their longing for work. Having a need for bodyguards and meat shields, Visk implored the pair to join them and the group became slightly bigger. Chango and Kirke were glad to be able to find the work and be able to support themselves. While Visk and Korek drew and posted crude wanted signs around town warning them of the incontinent necromancer, Kirke found daytime work at one of the local quarries. The night passed uneventfully. As the first rays of sunlight pierced the windows of the inn, Kirke went off to work while the others decided on a day of shopping. After Brother Faruk’s near death encounter at the hands of poor medicineship, Visk was able to procure 2 healing kits from the local scrounge shop. On his way back to the inn, a giant sinkhole opened up in the middle of town, sucking four hapless children and a woman. Kirke, being hero to the damsel in distress, grabbed rope to help those in the hole but was unable to keep his balance and fell in. Luckily he found the soft earth to be a great target and was unhurt. Several of the town elders were asking the townsfolk to back away from the hole as they attempted to rescue the victims. Visk, Brother Faruk, Chango, and Korek went into the holy after Visk spotted stone door along one of the far walls. Thus a rescue mission became a journey of exploration. At the first junction, two stone dwarves guarded the sides of the passage. Noticing these were doors, the party decided to go down the right path. This led them straight to an abandoned privy. Not ever abashed at the prospect of secrets and treasure, Visk lowered himself into the toilet and found nothing. Retracing their steps, the party took the left door and soon came upon a grisly scene. The smell of rotting flesh permeated their nostrils as two giant rats were feasting on a pile of human bodies. When Kirke went to push them away, they turned around and attacked him. As the rest of the party pushed forward to help him, Visk found himself surrounded by three rats and each feasted on one of his lower appendages. The party was able to dispatch them but our brave wizard was feeling a bit diseased. 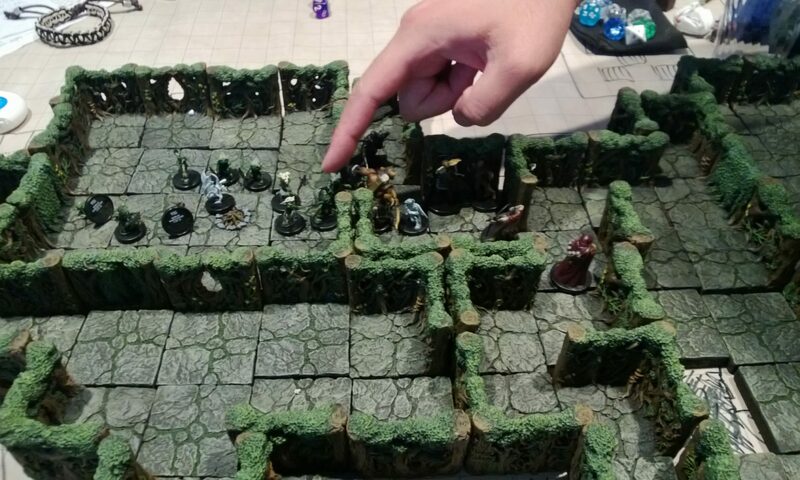 After a quick rest and diagnosis, the party pushed forward into a room with a floating rock. Unable to enjoy the simply pleasures of watching a rock float in the middle of the room, Korek went and removed the rock. Moving into its space, he realized that he as floating just as the rock had. This area permeates a magic of an earthly nature. As the delved deeper in, our heroes came upon a room with an enormous statue of a dwarf. As the rest of the party marveled at its posture, Kirke noticed the glint of an arrow and warned the party of the impending ambush. The fight was long and arduous. Korek was knocked unconscious and hope seemed lost as our brave knights kept falling prone thirty feet away from the enemies. Eventually they decided that they were men and engaged them. Thanks to Kirke’s shield bashing ability, the leader was finally dispatched and the remaining group was defeated. As they searched through the bodies, a familiar sign was emblazoned on each of the dead enemies’ armor. It was a triangle with a small vertical line at the base. After a short rest, our party collected the treasure at the feet of the statue including a very nice dagger. Choosing the eastern door, they opened it to find a balding, frail old man who began to beg for his life. Weary of deceit, the party questioned him profusely until they determined that he might just be slow in the head. As Baragustas lead them through the central corridor, the party came upon a humongous stone. Next to the stone was a half orc keeping watch and a child pinned on the floor by stones. As the poor boy cried for help, our “heroes” questioned the half orc about the underground ruins. They found out that some of the townspeople were in a group that called themselves the Believers. One of the leaders of the Believers was Rotharr Hatherhand, the father of the child. After tying up Grund the half orc and Baragustas, our so-called “heroes” left the kid pinned under the stones and went back toward the east, looking for the Delvers, a mystical group of bodies that were believed to be able to tell the future. They were also interested in the so-called prophet, Larrakh. Opening the door led into a giant chamber. There were rocks floating slightly above the ground and six bodies could be seen on stone tables. While sneaking and exploring, the scout Korek came across a hiding guard and the fight was on. Between Larrakh’s magic and the party’s horrible horrible horrible luck, the party was almost destroyed. Brother Faruk found himself using his healing to pick up Visk and Chango during the fight. As the party began to fall, Larrakh sensed his impending victory and could not help but gloat. “Your deaths shall signal the rise of the Cult of the Black Earth!” However, Brother Faruk had heard enough of the blasphemy and channeled the powers of his fingers into a single blast of energy. The bolt struck Larrakh square in the mouth and the cultist beat a hasty retreat as his followers began to fall. Although Larrakh escaped, our heroes have gathered some information on sinister activities that have happened in Red Larch. Everyone should now be level 3. This is the last time any changes can be made to characters.